Why not a Cruise Wedding? Grand Cayman is a favourite port-of-call for many cruise ships, and while visiting for the day many tourists plan a wedding or a vow renewal. Fortunately, our Marriage Law does not require a residency period. Once you land, you can be married that same day, all you need is a Special Marriage License and a marriage officer. Your marriage officer will take care of all the details once you have supplied your passports, proof you are free to marry (divorce decrees, or spousal death certificate from a previous marriage) and your ship's landing card. 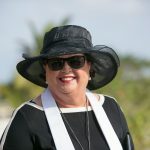 Most cruise weddings I do take place in the morning, and I have you back at the harbour by noon, giving you a few hours to enjoy George Town before you need to re-board your ship. Many people take cruises with family and friends, who come along to witness the ceremony. This is a perfect excuse for your own private beach party, and it can be a lot of fun. 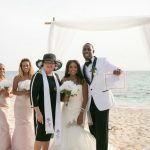 When I first started doing beach weddings I noticed a lot of brides would come decked out in full bridal regalia, but these days it is more usual for cruise brides to be more casually attired. Having a cruise wedding doesn't mean you can't have all the extras you have set your heart on, photography, bridal flowers, cake and champagne...the works. If you are being budget-conscious, I would say, if you don't have anything else, have a professional photographer. I know that most people have good digital cameras these days, but for your special day you don't want to have to worry about batteries going dead, cards being full and the disappointment that comes from not having the wedding photos you really want. If there will only be the two of you, let us know. We will provide the two witnesses required by our Marriage Law. 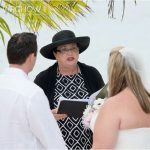 At the ceremony I give you a signed certified copy of your marriage certificate (suitable for framing) and later on when I have filed your wedding I send you the Registered Marriage Certificate, the legal document you need when you get back home. 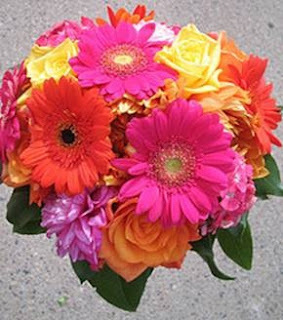 This is usually on it's way to you by post within 3 working days of your ceremony. The two most frequently asked questions I get are i) will our marriage be recognised back home ii) do you have a back-up plan when it rains. The answer to both questions is YES. 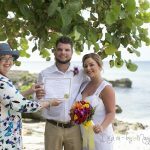 The Registered Marriage Certificate provided by the Cayman Islands Government is valid all over the world, and we have back-up plans for those very few days when we have inclement weather. We use a quiet beach on the northern end of Seven Mile Beach, where you don't have to be in the middle of a hundred other cruisers. We do only one cruise wedding per day, and there is nothing of an assembly line about it...you get my FULL attention.